What Is Left To Do, Except Make Boeuf Bourgignon? As you saw from Allison’s video of a snowy Beaune winter is really giving a coup de blues to Burgundians this year. What is there to do except make up some truly soul-satisfying winter recipes that provide a balm for the spirit? 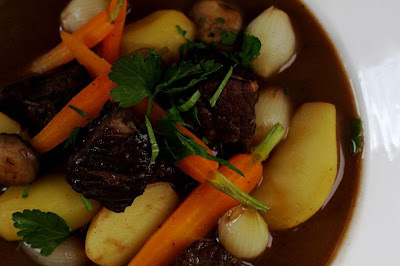 The most traditional of these in Burgundy is, of course, the famed Boeuf Bourgignon. Marjorie Taylor just posted her recipe for this French classic on her blog. All of Marjorie’s recipes are delicious, so I do urge you to try this one if you need some spiritual healing to make it through to Spring. And you can also dream about taking part in one of her amazing cooking classes, market tours, or dinner parties in Beaune. That doesn’t hurt either…nor does a 1991 bottle of Vougeot, either in or alongside your dish. This entry was posted in Favorite Recipes on March 7, 2010 by admin. wow… that looks truly delicious! Sounds yummy, I only like Italian food but this one seems to be a real feast. I just watched Julie and Julia and this really caught my attention. I hope someday I make it to your part of the world.